The goal of this lesson is to move images into patterns. When you place an image using the image tool, it doesn't have to stay where it is! 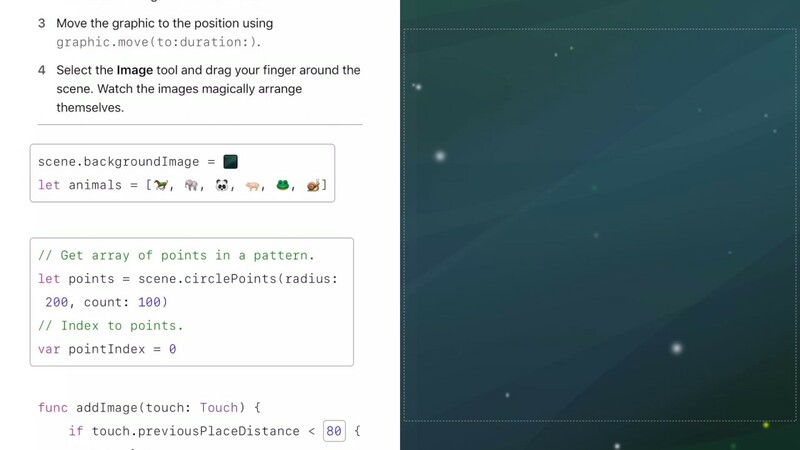 You can use code to move it anywhere on the scene, and even animate it by telling it how long to take to get there. The scene has functions that return an array of points in different patterns. You can move the images to these points as you place them on the scene. 1. In addImage(), after you place the graphic, add code to get the position at points[pointIndex]. 2. Increment pointIndex so that it's ready to get the next position. Add some code to set pointIndex back to zero if it goes out of bounds. 3. Move the graphic to the position using graphic.move(to:duration . 4. Select the Image tool and drag your finger around the scene. Watch the images magically arrange themselves. // Get array of points in a pattern. // Get a random image and place it. // Get position from points at pointIndex. Experiment with different points, functions, and parameters to get different patterns. Challenge: The points return by a pattern function are positioned around the center of the scene. You can easily add an x, y offset to each point, placing the pattern anywhere you like. See if you can place several patterns in different places on the scene. Next lesson, we will be looking at "Interstellar Symmetry".